Consider the canvas upon which you are writing. As we’ve already started to discuss in rule three, the selection of a font is greatly impacted by the medium upon which that font is to be placed. Fonts used on paper will appear quite differently when viewed on a computer monitor, TV, or iPhone screen. We won’t go into this too deeply because there are limitations inherent in selecting a typeface for use online. The code used to create web pages is still pretty basic. The coding system of the hypertext markup language (HTML) is designed to call upon the fonts that are loaded onto individual computers. As a result, it is difficult to know for sure exactly how the web page you have designed will appear to the user unless you limit yourself to the most standard set of fonts. By limiting our font selection we have the greatest likelihood of creating a page that will appear consistently across the greatest number of computers. One group of typefaces commonly appear on all personal computers running browsers. In basic HTML code these typefaces can be used with the reasonable certainty that they will display on most machines as anticipated by the web page designer. No guarantee, of course, but this is precisely the problem with getting too fancy with fonts when dealing with basic HTML-coded web pages. Here is that list. The first of the typefaces listed should look just like the rest of the text on this post. The other six should look different. 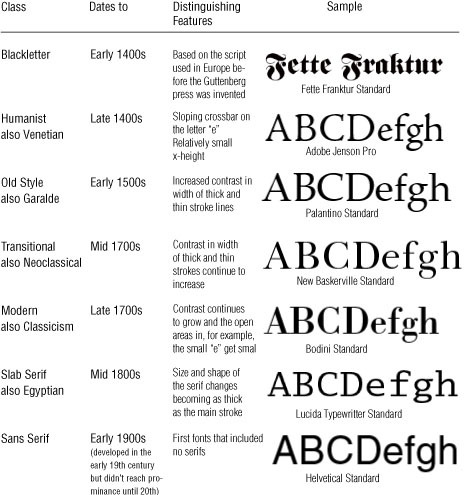 Now, lets look at a list of fonts that are not part of the standard set of fonts. The seven typefaces in the second group appear quite nicely on this machine; they are fonts in the font library of this computer. But, how they might appear on your machine, of that we can’t be sure. It all depends on whether or not your machine has or does not have, for example, the Haettenschweiler typeface in its font library. If the Haettenschweiler typeface is not there, a default font will appear on your screen, one that is, we hope, a close match. Sophisticated web designers have ways to get around this. They may embed graphical images of the things that they wish to appear in fonts not commonly found on the standard set-up for a PC or a Mac. Or, they will use sophisticated programming and backup databases in order to achieve the sort of display of unusual fonts that is provided, for example, on the web site Typetester.org. On that site you can select a font—typeface, size, and style characteristics (italic, bold, etc. )—and see it displayed on screen. For most non-programmers, this level of customizing gets quite complicated and the best advice is to stick with the standard web fonts. With time their numbers will increase and for the time being there are enough of them to provide some customization of the display. Remember rule number two: Do not go crazy with fonts! We’ve gone on a rather lengthy tangent on the subject of fonts used in web pages. Yet, there are so very many other canvases upon which text is presented. Billboards, for example, or shop windows, political buttons and posters, greeting cards, book marks, product packaging, engraved plaques, license plates, bumper stickers, T-shirts, tattoos, and the list goes on and on. For each, care must be given in selecting a typeface that will be legible on the surface being written upon and in the size necessary to fit the space available. Keep your eyes open and watch for examples of fonts. Once you do this you’ll be amazed at all the fonts you start noticing, some well chosen and effective, others, less so, perhaps. It’s a little bit like TV ads: there are great and memorable ads that people love, successful in terms of entertainment value but they aren’t really all that good if you can’t remember what they were advertising. Be sure your font choice doesn’t detract from your real objective, communicating. Romans versus Gothics… a classic debate. We use fonts to write; for this reason the legibility and readability of the output is one of the most essential aspects of selecting a typeface. There are, of course, applications in which the primary purpose of the font has more to do with producing a graphical image, when it becomes more a picture than text, often seen in advertising, but that’s not what we’re dealing with in our simple four rules about choosing fonts. Here, we will just ask the question, what is the best font for long text blocks? It is generally believed that serif fonts are preferable for long text blocks. This has to do with the fact that the serifs themselves help the eye move horizontally across the page, allowing for an easy flow and less eyestrain. For this reason—and because the history of fonts has been dominated by serif fonts—most books use a serif font for the body of the work, one of the many, many, many serif fonts. Chances are, avid readers—book readers—have become very comfortable with the serif fonts. They’re everywhere that serious reading is done and they have been for a long, long time. So these romans or serif fonts carry a certain… seriousness to them and, some even provide that most pleasant of characteristics, they just seem to disappear in favor of the text itself, at least when well laid out (this must be said because even a well-chosen font is not the whole answer to a successful layout). While some see the romans as classic and true, others find them staid and stale. Comic books provide another example of how that to which we are accustomed seems the best to us. Comic book text bubbles used to be handwritten during the inking process. As production of these works moved from the drawing board onto the computer, the question of fonts arose. Interestingly, the fonts used have, for the most part, been fonts that resemble the old hand lettered comic book styles. In a way this is much like the evolutionary process that occurred in the thirteenth century. The early fonts used in printing presses were also stylistic imitations of the hand-scripted letters common at the time in all European books. The pattern suggests that comic book lettering will evolve away from the hand lettered look and, in fact that is already happening. Here’s a link to a site on which you can scroll down and see examples of what are presented as Comic and Cartoon Letter Fonts. Does one’s preference for some typefaces arise from habit, the comfort level that comes with use? Or, is it a matter of legibility? Within the world of graphic designers, this debate—and in particular, the question, serif or san serif for text blocks—is a lively one, debated with surprising energy on both sides of the argument. The advent of the Internet has had a major impact on this debate. The plain truth is, while serif fonts on paper may well be the undisputed winners of the best-for-text-blocks font question, reading on monitors is an entirely different thing. Monitors present data at a much lower resolution than can be accomplished on paper. The standard resolution offered on a computer monitors is between 72 and 100 dpi (dots per inch). The resolution on a sheet of printed-paper is a minimum of three times that of the monitor, and that’s for a low-end dot matrix printer output. The printed page offers a resolution of between 300 and 1,800 dpi, or higher. This difference is enormous and has serious implications about the readability of text on screen. It is generally believed that san serif fonts make a better display for text online. This has to do with the fact that at lower resolutions little curves and details may become a distraction. Why? They aren’t rendered clearly. Thus a serif font may seem dirty, sloppy, or too busy on the screen while a san serif font appears clear, and sharp. So, the current standard wisdom for selecting a typeface for text blocks is, (1) if for print, use a serif font, (2) if for online presentation, use a san serif font. This may change as our tastes and habits change and as resolutions on monitors improve. But for now, it is a safe and trustworthy rule. Clearly, one of the important questions in choosing a font must be: What is my canvas? The poster at the top of this post is the creation of Francis Meynell, an accomplished graphic designer. The poster is part of a specially created collection that is really quite lovely to see and is available here. Here’s a link to a site that provides the results of a non-scientific survey on font preferences. The interesting thing here is the fact that you can see different fonts onscreen, compared by typeface and size and also see how others rated these fonts for legibility on the screen. Today, the second of four rules on how to select typefaces. But first, just in case anyone thinks that we’re exaggerating just how much thought has been expended on this subject— by people who know far more than we do—here is just a small piece of a beautiful flow chart designed to help in the decision making process. This chart was created by Julian Hansen and is availalbe online, in its entirety, here. Do not go CRAZY with fonts. It really is a good idea to restrict yourself to two or three typefaces on a single project. This is not as limiting as it may at first sound. Remember, a typeface offers a variety of font styles (italic, bold, condensed) so working with all the fonts of two typefaces actually gives you plenty to work with. Yes, yes, it is true, there are a very few exceptions to this rule but only an experienced graphical designer, with innate talent, should even try incorporating more than three typefaces on a single project. When deciding which fonts to combine in a single manuscript or display piece be sure the different fonts are different enough that they produce contrast, but not too much, and not too little… Balance is essential. On one hand, two totally clashing fonts can produce too much contract. That is not good unless the very thing you’re trying to convey is conflict. On the other hand, the use of two very similar fonts is problematic for another reason. Two fonts that are very similar can produce a sense of confusion as the eye notices the differences but on a more unconscious level than a conscious one. This disrupts the act of reading as the mind is pulled away from the meaning of the words a bit to try and figure out… what is different here? Newspapers are a good example of how to mix a limited number of typefaces to good effect. One practice seen in newspapers regularly is the use of a serif typeface for the body text and a san serif typeface for the headline. Newspapers are also a good example of something we’ll look at in tomorrow’s post, the all-important matter of legibility. One last point—We want to be sure and repeat one of the links we provided in yesterday’s post. The site was created by a graphic designer, Marko Dugonjic, and is quite lovely, in addition to being very useful. This site allows you to select fonts and see how a small text block produced with that font will look on the screen. Better yet, you can see three text blocks produced with three different fonts, next to one another so that they may be compared easily. Here’s the link. There are literally thousands and thousands of typefaces available for use on computers these days. 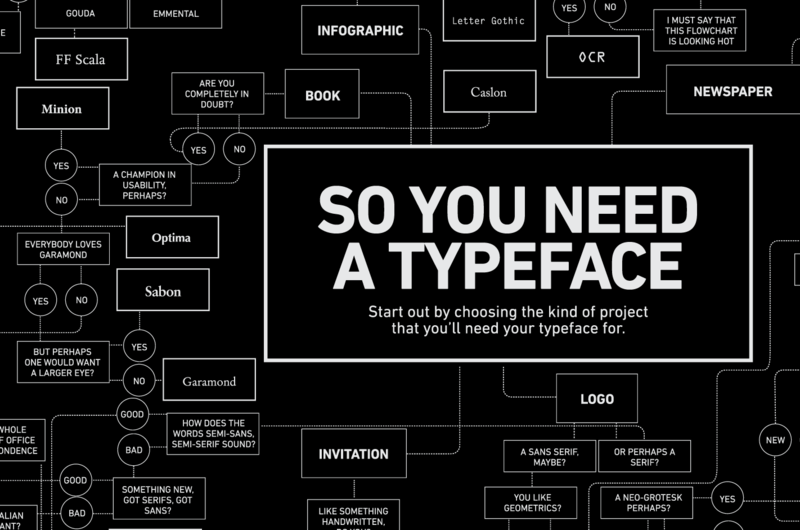 Choosing a font to use for a particular project can be downright daunting. Of course, the truth is, most people don’t give this a lot of thought. Most of us work with only a small number of fonts, those that come along with our software packages. Unless needed for a very particular task, we rarely, if ever, go out and purchase fonts or even download fonts available for free. Nonetheless, even when selecting fonts from a more limited list–hundreds instead of thousands–some general rules of good graphical design are useful. What follows is the first of four general rules for the selection of typeface. We’ll post one rule each day. If you’re interested in a deeper look at the topic, we’ve provided a list of links at the bottom of this post to an amazing array of fascinating web sites. These sites, mostly designed by and for graphic designers, go into deep contemplation of such things as, for example, choosing a font whose x-height and serif shape suite the subject matter of the text. Really. Consider the content. If you’re designing a wedding invitation, the fonts you’ll be drawn to are not likely to be the same ones you’d be drawn to while making an advertisement for a garage sale. Seems obvious but matching the font to the content is rule number one. Fonts convey a mood in themselves and can be used quite effectively to reinforce the intended theme, mood or tone of the message. Typefaces are, after all, just part of getting a message across, communicating. A simple example of the idea that fonts have personalities can be seen in comparing the fictional company names in this graphic, each name is presented in two different fonts. The fonts used in the blue, left hand column seem to produce dissidence, the style of the typeface conflicts with the sort of business the name suggests. Would you agree? We ask because this idea of font personalities is somewhat subjective. There are web site which offer personality tests (in jest, we think) and match you with the font which bests suites your personality. Here’s a link to one such site. So, to the extent possible, look at the font and see if the personality it is projecting–playful, bold, romantic, traditional, cutting edge, trustworthy, etc.–fits with the topic of the mateiral being typeset. That’s rule number one. Tomorrow, RULE 2 — Do not go crazy with fonts! Today we look at the evolution of typefaces from the years before the Guttenberg Press through the early years of the twentieth century. The earliest faces, very naturally, resembled the hand scripted style used in Europe during the thirteenth century. These are known as Blackletter and it is very hard to imagine reading an entire text produced with this heavy font style. Yet, for the few who were literate in that time this elaborate, heavy font seemed quite readable. 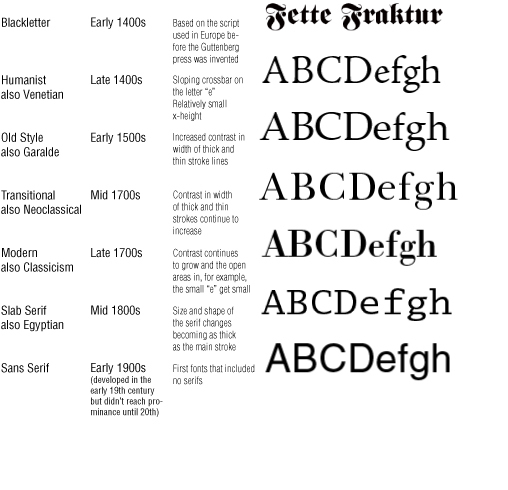 The following table outlines the typeface classes that mark the evolution of type over 600 years. The table is a mere summary of this very interesting story. 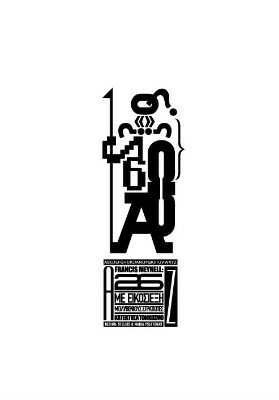 We must add a plug for the blog called “i love typography,” the creation of John Boardley, a graphic designer. A link to that blog is here. It tells the story with flair and style and is well worth checking out if you are at all interested in knowing more about fonts— or just seeing how interesting the topic can be in the hands of a person who has deep knowledge and a love of the subject. The Moderns need lots of space (white space and inter-line space), so give them extra leading and generous margins; and if you pair a Modern with another face, then make sure it’s not a fussy one, or your page will look like a circus poster designed by a visually impaired dog. We’ll get into all of this tomorrow. Again, our font sample come to you thanks to the Adobe sales site, accessible here. Font classification systems come in many flavors and the terms used in referring to fonts and typefaces are often used interchangeably. This makes things very complicated for all of us non-typographers. We’ll keep things easy and present just two of the classification systems. Today, a very basic system based on the general style of the typeface. Tomorrow, a system based on the historical evolution of typefaces. And after that, we’ll get into how to select the best font for a particular purpose or objective. In this classification system typefaces are divided into four general classes, the first two are broader classes than the second two and, in fact, a Display or Decorative font may be either Roman or Gothic. Roman – All typefaces with serifs (the marks that extend beyond the actual stroke of a character). In common usage, people will refer to a font as roman by way of differentiating it from italic, in other words, an upright font style. Gothic – All typefaces without serifs. This may be a bit confusing because of the natural tendency to think of gothic as an old style, 15th century sort of look and yet the san serif styles are actually quite contemporary. 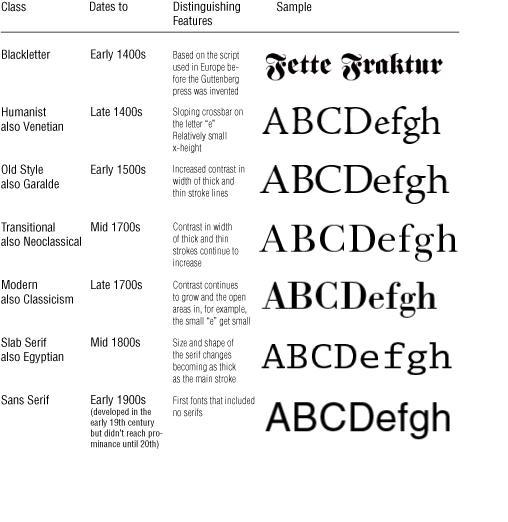 For this reason the gothic class is often just referred to as San Serif. Script – All fonts that are designed to look like longhand, a flowing handwriting. Display or Decorative – All fonts that are designed primarily as flashy or very stylized letters for use on invitations, diplomas, large scale signs, posters, advertisements, and the like. To any of these typefaces may be added additional descriptive suffices or “type styles” like: italic, condensed, narrow, bold, oblique, and others. Such descriptions become a part of the font name since the font is the precise typeface including type style and point size. For most people, this level of classification is sufficient. But, we sort of like going deeper, getting the etymology, if you will, of the subject. So, tomorrow we’ll present an historical classification system before we move on to looking at what fonts are best for what applications. The font samples we present here come from an Adobe site that sells fonts and presents them by a number of look up systems that are in themselves quite interesting. As a “woman of a certain age,” and reading your recent post, I was reminded that “fun with fonts” was unknown to me when I became a self-described “typewriter” around the early 1960s in the Old Country, in Germany. The typewriters then in use, on which I learned the skill, had a single font or typeface. Mine was a manual machine and required quite a punch to produce a printed page, especially when using carbon paper to get more than one copy of the text. And I am also sure that few of the current generation have even heard the words “cut a stencil,” which was done on the typewriter but without the use of the inked ribbon. 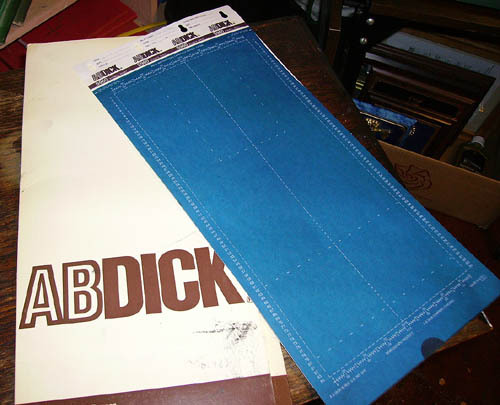 My colleagues of a “certain age” will also remember that correcting an error on a stencil was done with a blue correcting fluid that, once dried, created a new surface that could be cut again. From these stencils hundreds of copies of the “Daily Bulletin” I composed for my Ramstein Air Base employer could then be reproduced. That manual typewriter had evolved into an electric machine by the time I returned to work in this country in the 1970s. A “ball” had replaced the metal characters affixed to the tips of tiny mechanical arms, and changing balls you could change the font that appeared upon the paper. We still have one of those old Selectrics in the basement but have begun to consider releasing it from its useless existence. The silicon chip era and the first computers arrived in the late ‘70s or ‘80s. With its dawn typing, using the ten-finger touch-typing method, was quietly dropped as a course in high schools. Typing had turned into keying and required an ever-so-much-lighter touch by the keyer. No longer did students have to work at learning to hit letters hard but carefully in order to avoid making mistakes. Whiteout was no longer needed. A rapid succession of strokes on Backspace could erase many or few errors. And editing became quite easy. Numerous typefaces, font sizes, bold face, italics, etc.—borders and background colors—etc., etc., are now at the keyer’s beck and call. Babies are already fascinated—and peck at their very own toy laptops where they learn this new skill by osmosis. Yes, we’ve come a very long way indeed from the days of those ancient monks—who lovingly and laboriously “scribed,” elaborated, and decorated those illuminated texts we now find in museums and monasteries—to the age of the half-grown and one-quarter educated texting on I-phones with their thumbs, using curious abbreviations, with an abstracted look of rare concentration on their faces. 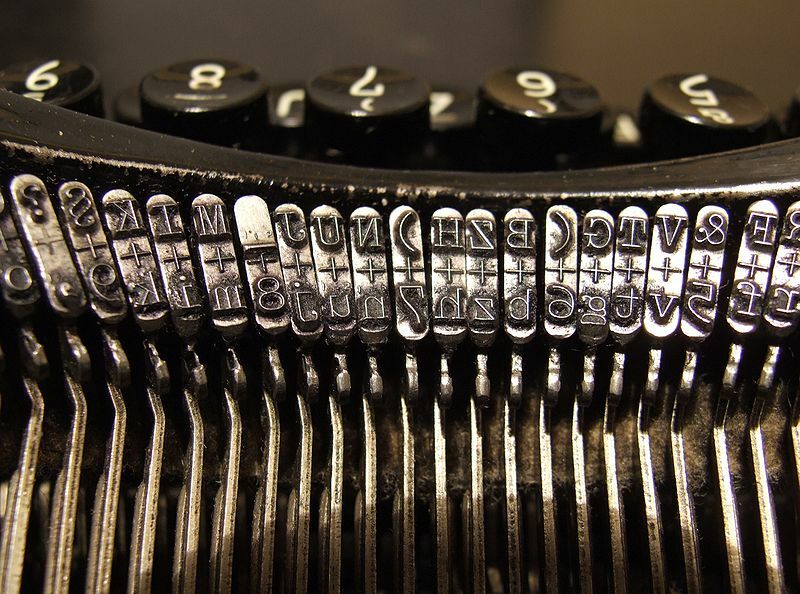 Typewriter keys: Here’s lookin’ at you! 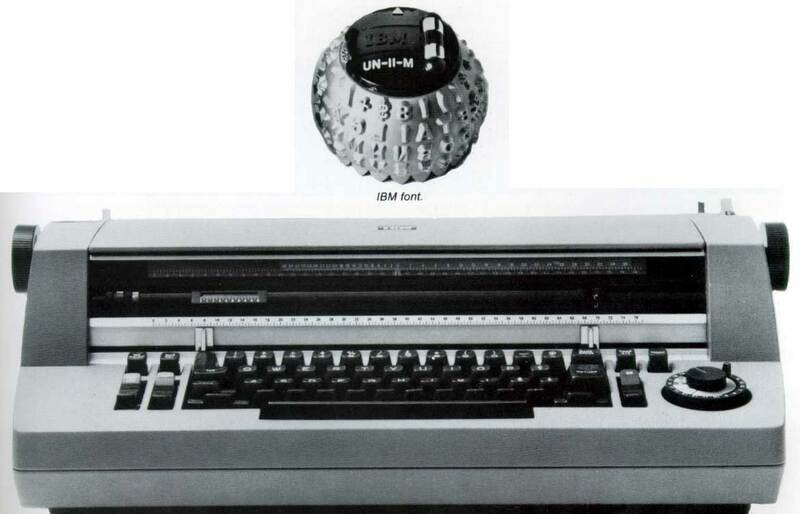 The IBM Selectric–and the versatile ball you could change to change fonts. IBM Selectric, Rutgers University projects site here. The Stencil, Charles Richard, here. 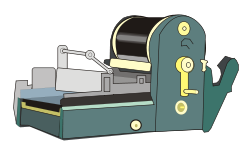 And the Mimeograph machine, courtesy of Answers.com here.